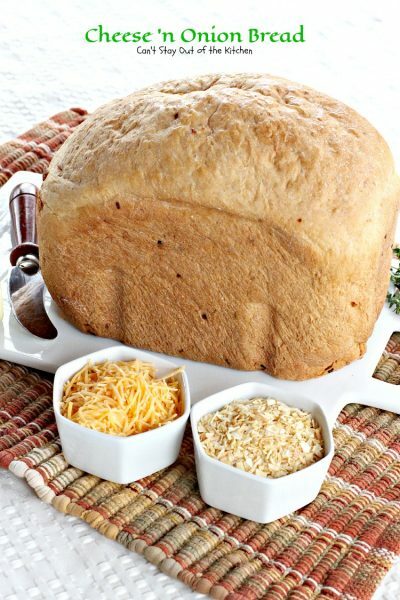 Cheese ‘N Onion Bread is a tasty recipe from our Black and Decker Breadmaker cookbook. 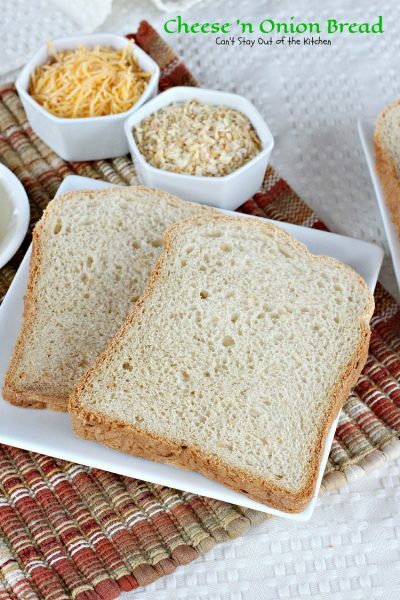 It has lots of savory cheddar cheese and onions that give the bread a marvelous taste. You just throw everything in the breadmaker and it does the work! I can do easy! This is one of the loaves I have made repeatedly when taking a meal to others, too. We love bread . . . especially homemade bread. 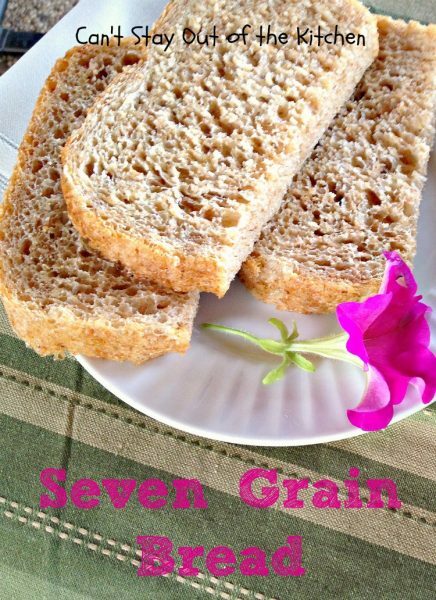 I grew up with a strong tradition of home baked bread as the only kind of bread I ate for years. After John and I married I finally asked my mom to teach me how to make her homemade bread and after I finally gained some proficiency in the art of bread-making I made it a lot for our family. There is nothing like a thick slab of homemade bread toasted for breakfast, with sunny-side-up eggs over top, made into cinnamon toast, or broiled with butter and then lots of juicy jams or preserves slathered over the top. I also used to toast it a lot and add peanut butter and fluff and make these humongous and very delicious sandwiches. Home made bread is simply heavenly. The smells of baking bread wafting through the house are so wonderful. I have to admit to being quite a bit of a “smell” person. I love beautiful smells. (Keep me away from anything stinky though!!!!) 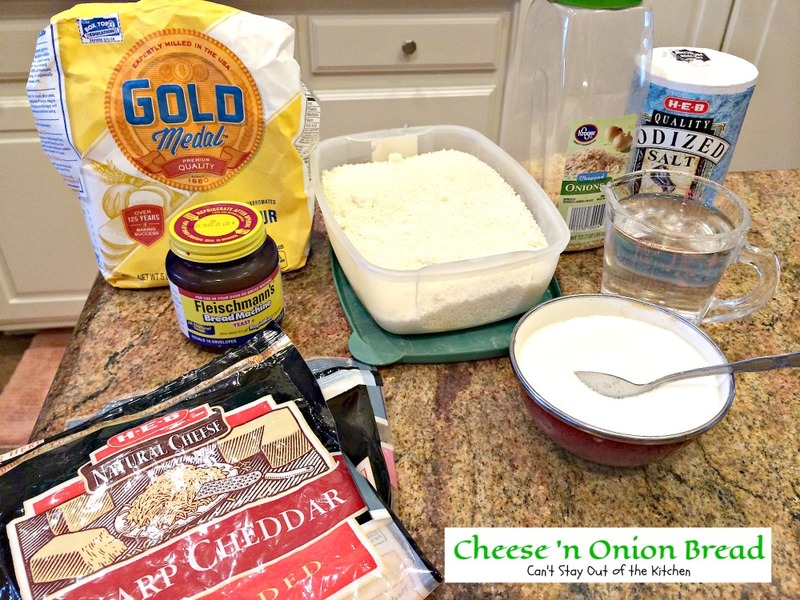 This Cheese ‘N Onion Bread smells divine while baking and it tastes just as great. Cheese ‘N Onion Bread is quite dense in texture so you can do a lot with it other than just eating it plain. Consider placing slices of bread on a large cookie sheet and spreading the pieces with sliced or shredded cheese and herbs like parsley, minced garlic, chives, dill weed, or thyme, and toasting in your oven for a few minutes. Yummy! You can also spoon some leftover spaghetti sauce over top and then sprinkle with mozzarella cheese and bake for about 5-10 minutes. This is a great bread to have fun with. We love this lip-smacking bread and believe you will, too. 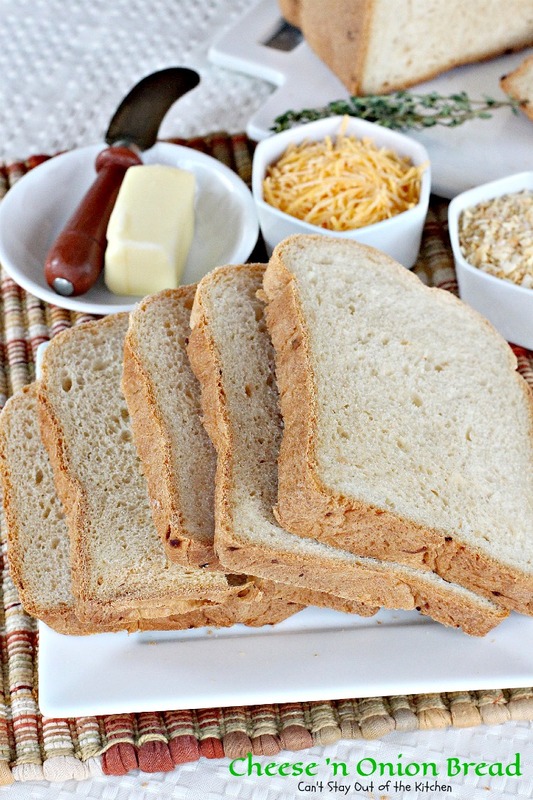 Why don’t you give this easy breadmaker bread recipe a try sometime. You will need a 2-lb. loaf pan breadmaker to make this recipe. Enjoy! When I initially posted this recipe in February 2013, it was before I purchased my better Canon camera. The pictures were taken on a poor quality iPhone 3 or 4 so they were dark, grainy and definitely not as pleasing to the eye as I would have liked. Cheese ‘n Onion Bread is wonderful smothered with butter. 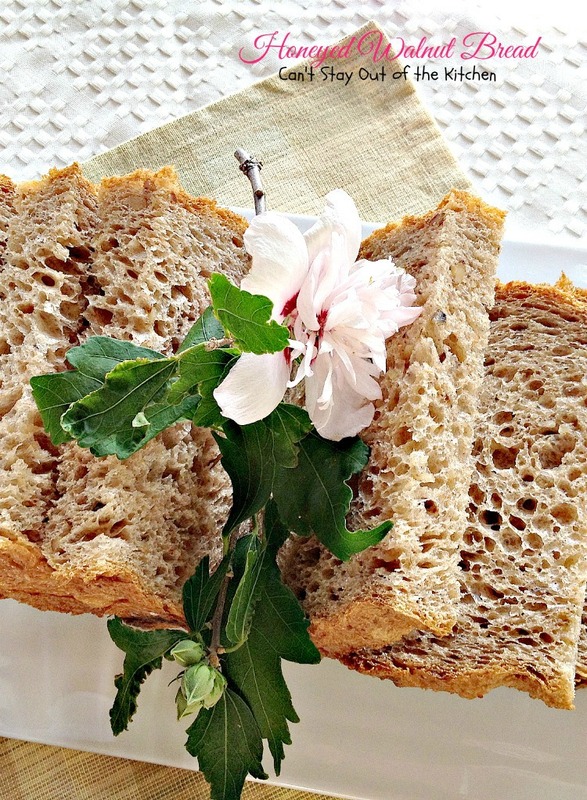 We like our homemade breads served with honey, too, even if they are more on the savory side. 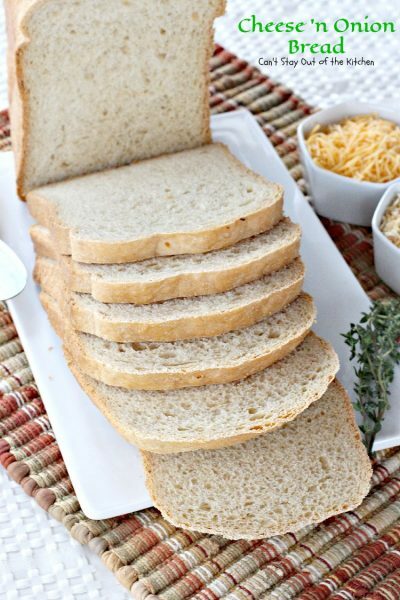 Each two-pound bread loaf of Cheese ‘n Onion Bread cuts up into about 15 slices. 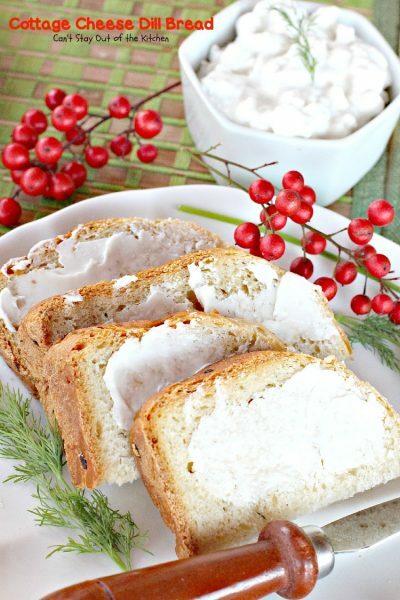 I can make a meal of homemade bread with butter and honey or jelly! Oh, my! This tasty dinner bread is delicately flavored with cheese and onions. Measure out hot water and place in bread canister. Add powdered milk, sugar and salt. Use only bread flour for making homemade bread. It has more gluten than regular flour so it raises easier. It is also UNBLEACHED so it won’t toughen as easily as bleached all-purpose flour will. Measure out flour and add to bread pan. Add dehydrated minced onions, cheddar cheese and yeast. NOTE: this recipe does not call for oil or shortening. Allow bread to cool in pan about 15 minutes. Invert onto bread board. Butter the top and sides of the loaf so the crust doesn’t harden too much. Allow the bread to cool an additional 15 minutes before cutting in slices. 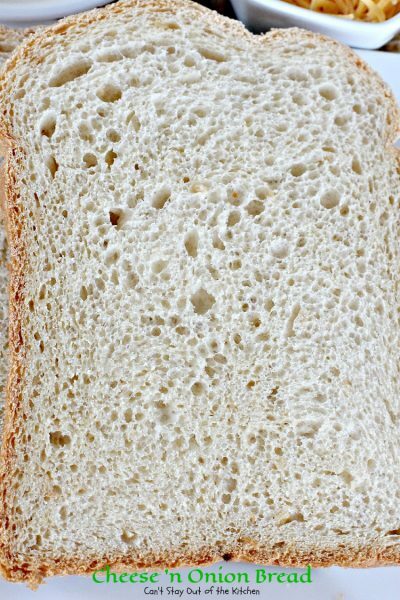 Here’s a look at this delicious bread. It really puffs up nicely in the breadmaker and bakes a nice loaf of bread. We love Cheese ‘n Onion Bread and think you will too if you give it a try. Spread your bread with a little butter and drizzle with honey. This is also an excellent bread to use with dipping oils and to serve with pasta or Italian dishes. 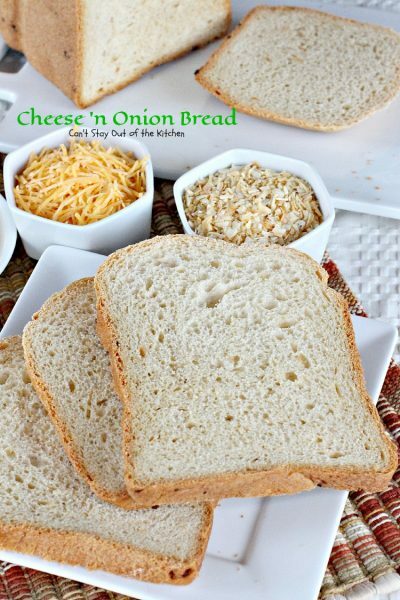 Tasty and savory dinner bread that incorporates cheddar cheese and dehydrated onions for superb flavor. 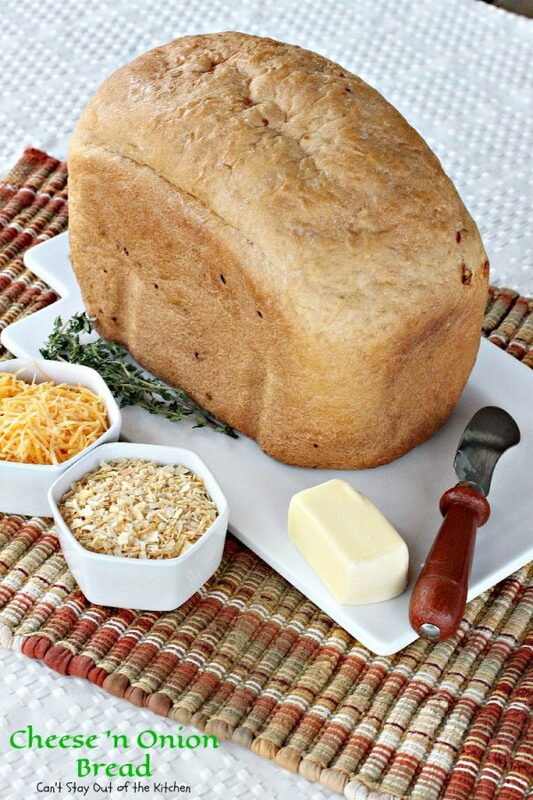 This 2-pound loaf is made in the breadmaker so it's quick and easy. This recipe uses no oil. Measure ingredients in the order listed into bread pan. Insert baking pan into oven chamber, twist to secure. Select: Regular basic bread setting. My breadmaker takes about 3 1/2 hours at this setting. Remove bread from oven chamber. Allow to cool on bread board about 10-15 minutes. 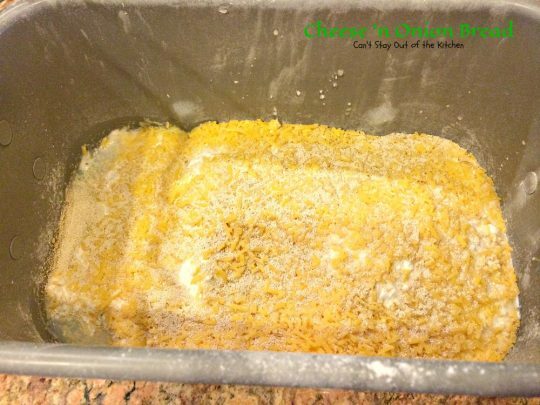 Remove bread from bread pan. Butter the top and sides of loaf to prevent bread from getting hard. Allow to cool completely or at least 15 more minutes before slicing. NOTE: Please note that this recipe doesn't call for oil or shortening as the cheese has a high enough fat content from the cheese. NOTE: Refrigerate bread after two days to prevent mold since it doesn't have any preservatives in the dough. Tasty and savory dinner bread that incorporates cheddar cheese and dehydrated onions for superb flavor. 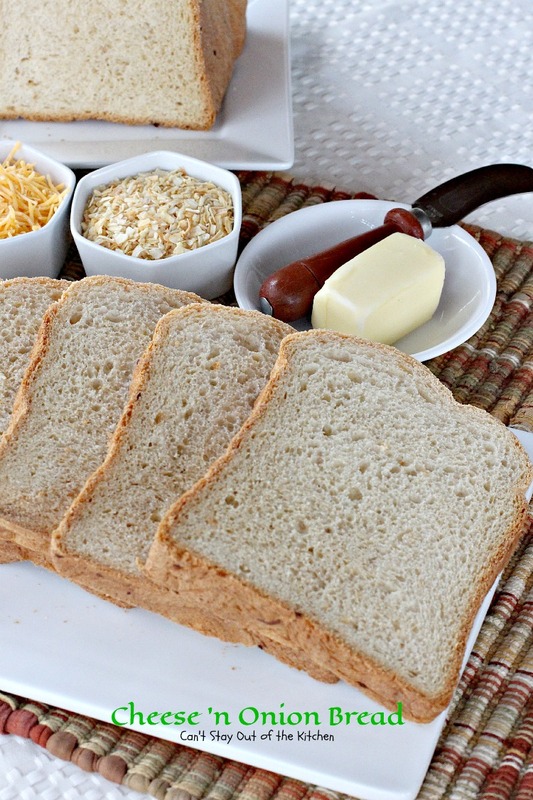 This 2-pound loaf is made in the breadmaker so it’s quick and easy. This recipe uses no oil. Please note that this recipe doesn’t call for oil or shortening as the cheese has a high enough fat content already. 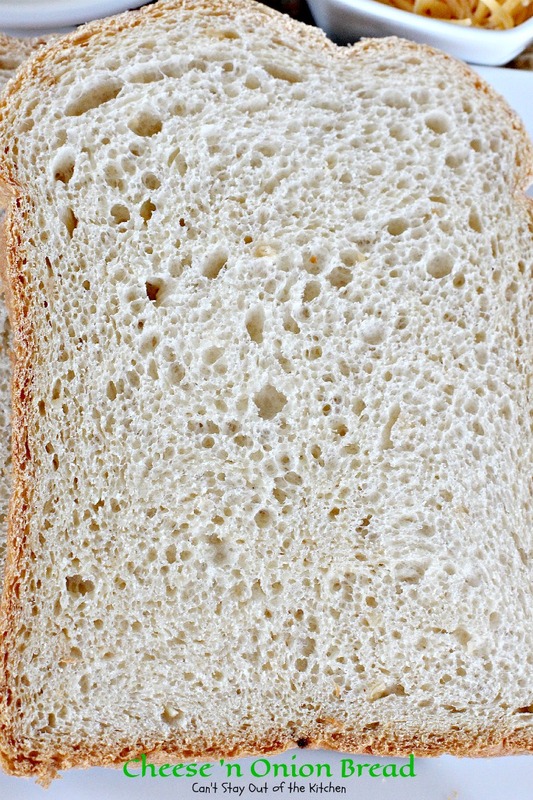 [br][br]Refrigerate bread after two days to prevent mold since it doesn’t have any preservatives in the dough. 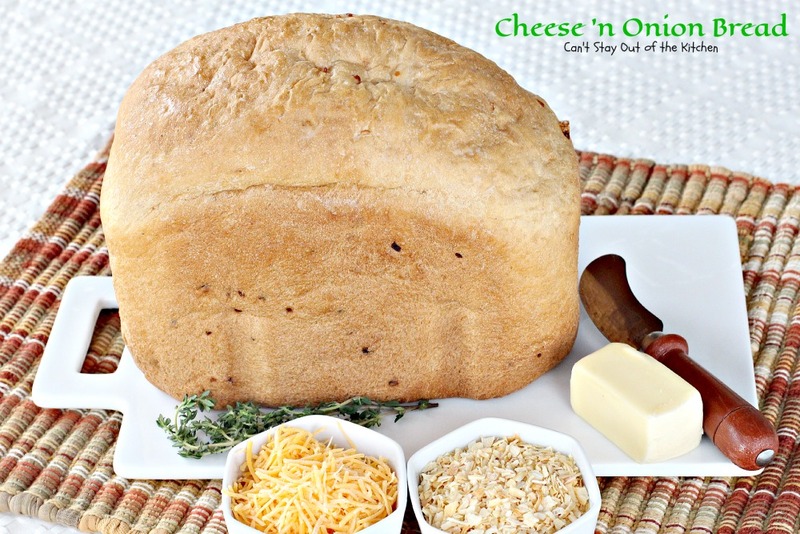 Homemade Cheese ‘n Onion Bread is a great bread to serve company or to take to potlucks. Remember to only keep home baked bread out on your counter for about 2 days. After that it needs to go in the refrigerator to prevent mold since it doesn’t have any preservatives in it. The texture of Cheese ‘n Onion Bread is dense so it’s great for adding cheese and herbs and toasting in the oven and serving it that way, too. I love to make homemade bread to give away to people when I take meals to them. It always adds a nice touch. Teresa, this looks beautifully delicious. I love homemade bread but never make it! Hey, this is breadmaker stuff. SOOOOO easy. It takes 3 minutes to throw all the ingredients in the pan and that’s it!!! You can do this, kiddo! Yes. One of these days I’m going to get around to making some gluten free stuff too.